Hurricane Jose strengthened Sunday as it churned its way north through the Atlantic Ocean as a Category 1 storm, with maximum sustained winds of 90 miles per hour. Tropical Storm Watch is in effect for much of the Jersey Shore and Long Island as Hurricane Jose will make its closest pass to the Tri-State region late Tuesday into Wednesday. The centre of Jose will stay offshore so the greatest impacts will be felt right along the coast with dangerous surf, strong rip currents, beach erosion and coastal flooding. Wave heights can top out between 10 and 15 feet. The strongest winds will be over eastern Long Island, with gusts up to 50mph. Farther west, including the New York City area, winds can gust over 30mph at times late Tuesday into early Wednesday. As far as timing, some of the outer rain bands from Jose could arrive late tomorrow night, but conditions will deteriorate more significantly on Tuesday as it becomes increasingly windy and rainy. This will last through Tuesday night and perhaps into Wednesday, especially on Long Island. Even as the storm departs later in the week, the ocean will remain rough with high surf and strong rip currents. The storm was located about 355 miles southeast of Cape Hatteras, North Carolina Sunday and heading north at 9 mph. The National Hurricane Center advised East Coast residents from North Carolina on up to monitor the storm's progress. The most likely of the computer models would put the storm at least 250 miles off the coast of the New York area. The sustained winds increased Sunday morning, but Jose is still expected to gradually weaken as it pushes northward over the next few days into less favourable atmospheric conditions. Jose is already producing dangerous surf for Bermuda, the Bahamas, parts of the Caribbean, and parts of the US East Coast. 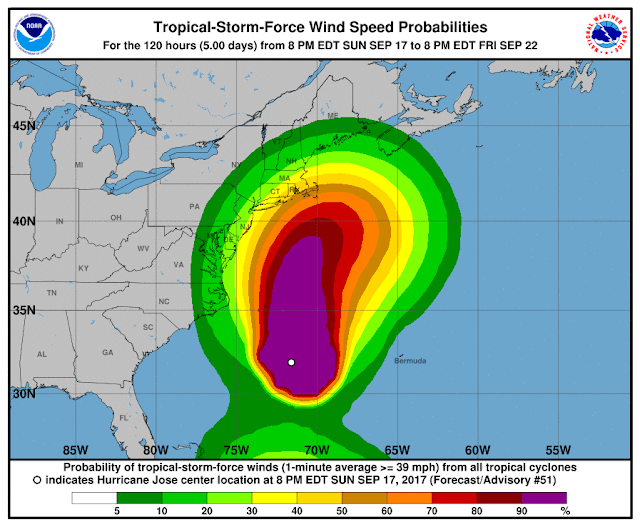 While Jose is projected to weaken and veer away from any direct impact on the coast, the Hurricane Center said a minor shift could bring tropical-storm-force winds to North Carolina's Outer Banks or areas to the north. The storm formed Sept. 5 in the open Atlantic, brushed northeast Caribbean islands as a Category 4 hurricane and did a loop the loop before tracking west again toward the U.S.